Kristen Weld’s Paper Cadavers: The Archives of Dictatorship in Guatemala. 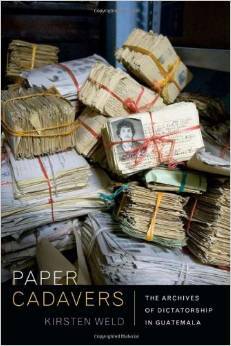 “In Paper Cadavers, an inside account of the astonishing discovery and rescue of Guatemala’s secret police archives, Kirsten Weld probes the politics of memory, the wages of the Cold War, and the stakes of historical knowledge production. After Guatemala’s bloody thirty-six years of civil war (1960–1996), silence and impunity reigned. That is, until 2005, when human rights investigators stumbled on the archives of the country’s National Police, which, at 75 million pages, proved to be the largest trove of secret state records ever found in Latin America”. “This is a book about the mundane: the library card, the promissory note, the movie ticket, the PDF (Portable Document Format). It is a media history of the document. 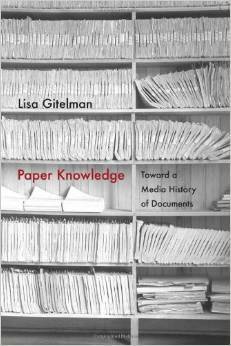 Drawing examples from the 1870s, the 1930s, the 1960s, and today, Lisa Gitelman thinks across the media that the document form has come to inhabit over the last 150 years, including letterpress printing, typing and carbon paper, mimeograph, microfilm, offset printing, photocopying, and scanning”.